Nintendo Experimenting with 3DS as a Cafe Controller, Zelda, Starfox, Mario, and More! The Legend of Zelda : Ocarina of Time 3D development is finished. Nintendo is now checking the translations of the game. The game will be available shortly after E3 2011. The Legend of Zelda : Ocarina of Time 3D is an improved version. The game now runs at 30 frames per second on 3DS, instead of 20 frames per second for the original version. The Legend of Zelda : Ocarina of Time 3D includes a special mode in which you can fight all the bosses of the game. Master Quest mode lets you play in mirror mode (reverse all the backgrounds, enemies appear and move in different ways, etc.). Starfox 64 3D development is finished. This time, the game will have the same name in all countries. Super Mario 3D is still under intensive development. Mario Kart 3D will be released this year. Super Mario 3D will be a combination of Super Mario 64, Super Mario Galaxy and New Super Mario Bros.
Super Mario 3D will be fully unveiled at E3 2011. The logo of Super Mario 3D has a raccoon tail. Super Mario 3D will include a fixed camera system, slightly like the one you saw in Super Mario 64, in which the camera does not move and Mario walks around on the screen. This time you will really feel the depth. Shigeru Miyamoto explains that this method brings dynamism to the staging of the game. 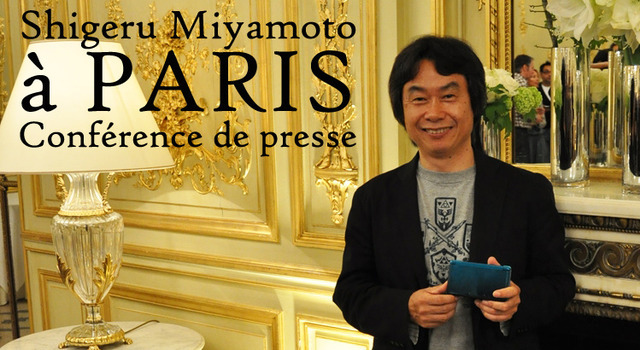 This game mechanic certainly will impress and entertain the players says Miyamoto. Nintendo is currently experimenting several entirely new 3D concepts, Miyamoto is testing a game in which the player must discover which object is being displayed by moving it in different ways, in order to see the different facets. An object that looked like something could prove to be completely different afterall, the goal for Miyamoto is to use 3D to make the players feel surprised. Nintendo is also testing a game in which an image is only visible to the left eye, and another image is only visible to the right eye. Miyamoto would for instance use this original concept for a Ghost game in which the player would not necessarily see what is coming in front of him! Miyamoto says he loves Ghost stories! Nintendo is currently thinking about a possible connectivity between the Nintendo 3DS and a future home console, the Nintendo 3DS could be used as a controller. Nintendo is still testing many ideas. Miyamoto reiterates the point about how using the touchscreen in OoT3DS helps with the Water Temple. Mentions to specifically watch the cutscenes in 3D. 30fps made it necessary to rework the animations. You can aim the bow/slingshot by moving the system. Miyamoto recommends to do this when no one’s around to see you, lol. Starfox 64 3D : Motion controls in StarFox, too. You can select the aiming mode in the options (as in, shooting directly at your target or taking into account your beam’s movement and that of your target). Someone asked about the lack of dual analog on the 3DS. Miyamoto says that a second stick had been considered but they decided against it because it’s common to use just a finger to play. Adds that proper implementation of gyro controls should be better than a second stick for the purpose of controlling a camera. We’ll see if we can get a fully translated interview done with subtitles at a later date just in case there are some minor details that may be missing from the initial report.